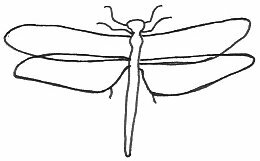 To produce realistic dragonfly drawings, just copy this simple template and then finalize it with the details that you visualize. If you're like me and a bit shy on good imagination, a reference picture will do the job and then you can change it however you like. 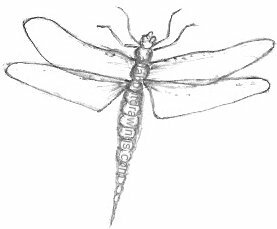 As you can see, the dragonfly outline is very basic which makes it an ideal topic for beginner artists to use as a model. I taught myself to draw by copying line for line but that may not be the way that suits you. Half the fun is finding a method that resonates within you and where you are comfortable. On the other hand, if you do want to copy by sight only but you're finding it difficult, you might benefit by the using this measuring tip to help you successfully construct an image. The dragonfly is a harmless insect with a long thin body and two pairs of wings. The wings are fragile and transparent but that doesn't stop the dragonfly from flying very fast. They benefit us by eating flies, mosquitoes and other pesky insects. You will likely find dragonflies around water which is their breeding ground. This insect has six legs. It can perch on its legs but it can't walk. It catches other insects using the legs or jaws. Adult dragonflies live up to only a few months but the life span is up to five years. A young dragonfly is called a dragonfly nymph. When I research any art subject, I feel very satisfied to know I just expanded my knowledge base. 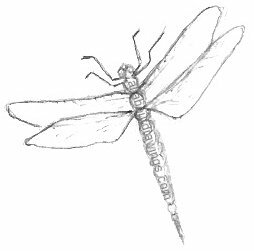 Start off by copying the dragonfly outline -- did you know that single act constitutes drawing practice? Ok, so now draw it again only this time add in the extra details like fine lines on the wings (remember the wings are transparent) and fill out the body. I am sure you will have a fine likeness when you are finished. Be a kind judge and generously allow for your level of experience at an early stage. Whenever you are browsing through magazines or leaflets, it's a good idea to keep any pictures that you think you'd like to draw and store them in a folder. 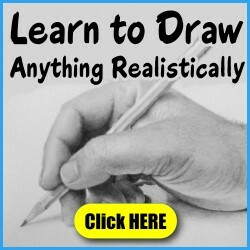 This saves a lot of time because when you get a spare moment to draw, all your reference material is ready with all things that you are keen to illustrate. There's nothing like a little incentive to get us going. My Mum did these dragonfly drawings for us (thanks Mum!). We always get together to do some artwork and generally have a lot of laughs. It's nice when we do art together, we chat about different things and Mum is terrific with her encouragement and advice for my drawings. So, next time you do some drawings of dragonflies, encourage a friend to join you and spend some quality time with each other. It's a time you will always cherish and remember.